The National Junior Classical League is hosting this summer’s Convention in Fargo, North Dakota at North Dakota State University! Curious what NJCL Convention is like? View a highlight video from 2017 Nationals at Troy University from Historian Ellie Kammerer, and check out Mr. Dean’s blog on Instagram! Here is the formal invitation to 2019 NJCL Convention from the NDJCL Executive Board! If you are going to Nationals, be sure to read the Guide to Nationals 2018. If you are attending nationals, be sure to purchase an OJCL spirit package here. If you are a JCLer, there is no need to pay extra for the welcome shirt, it is included with your spirit package. If you are an SCLer, you should purchase the welcome shirt as a separate item. 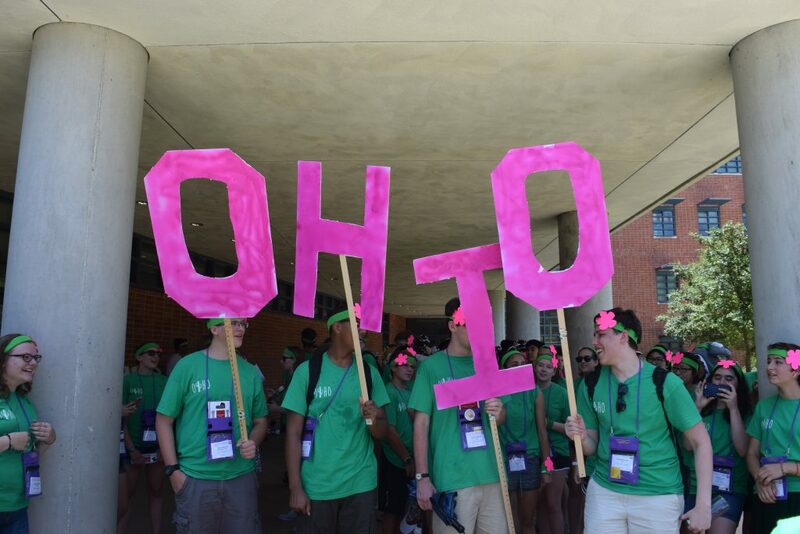 As Ohio is the host state this year, we are asking all Ohio students to arrive to convention early to help other states unpack. Therefore, the North/Central bus will leave at 6 am on Sunday, July 22nd from Shaker Heights High School (north parking lot) and head to Columbus for pick up at 8:15ish from the Polaris parking lot by the food court. Return: 9 AM departure from convention. Here is the link for Nationals attendees to order the spirit package (state t-shirts + materials for spirit), only $15: Ohio Junior Classical League National Spirit Package 2017. Click here for information about the national convention, including how to register and the cost. Click here for information about the Summer Latin Program at Summit – this is especially good for students interested in certamen. Click here for information about tryouts for the OH Competitive Certamen teams. See below for information about transportation! The payment for the bus was calculated based on 50 students, but only 40 signed up. To make up the deficit, each student will need to pay an additional $38.63 to OJCL. Checks can be given to me when boarding the bus on Sun July 23 at 8 am. Please note that this is a new departure time! The bus will leave Summit on Sun July 23 at 8 am. After about 4.5 hours, we will eat lunch and then visit the Parthenon in Nashville TN. The cost is $3. There will be a 30 minute guided tour and then some time to walk around. We will then make the 5 hour trip to Troy. The bus will leave Troy University on Sat July 29 at 9 am and will return to Cincinnati around 7 pm. NJCL T-shirt Contest! We are seeking the best designs from across the state of Ohio to help design this year’s shirt for Nationals at Troy University! Enter for the opportunity to see your own design on our state t-shirt! Read over the rules and guidelines, and send submissions to Treasurer Grant Bruner at treasurer@ojcl.org. Excited for Nationals? Watch this 30-second video with clips from the National Convention at IU! Apply for 1 of 10 $100 scholarships to the 2017 NJCL Convention. Click here for the application. Deadline is March 10. Dean’s Blog of the 2016 NJCL Convention at Indiana University. Dean’s Blog of the 2015 NJCL Convention at Trinity University. Dean’s Blog of the 2014 NJCL Convention at Emory University. Dean’s Blog of the 2013 NJCL Convention at the University of Nevada, Las Vegas. Dean’s Blog of the 2012 NJCL Convention at Wake Forest University. Dean’s Blog of the 2011 NJCL Convention at Eastern Kentucky University. Watch a highlight video of the 2016 NJCL Convention below from 2nd VP Joseph Delamerced! For those people going to Nationals, here is the link to order the spirit package (state t-shirts + materials for spirit), only $15: Ohio Junior Classical League National Spirit Package 2016. Announcement: OH Competitive Certamen Teams at NJCL 2016 at IU! Thanks to all players who participated in the tryout process! Excited for Nationals? Check out this 30-second promotional by 2nd Vice President Joseph Delamerced (Summit). This summer, the NJCL Convention is from Monday, July 25 through Saturday, July 30 at Indiana University in Bloomington, Indiana. Students and teachers stay in the student dormitories (girls and boys in separate housing) and eat in the student dining halls. All events are on the campus, within walking distance. Much of the campus is completely devoted to the National Convention. Activities at Convention include: academic tests, certamen, graphic arts, dramatic performances, team sports (volleyball, soccer, etc. ), swimming, track & field, chess tournament, dances, toga parade, Talent Show, Latin-related workshops and presentations, and much more! See more information about the NJCL Convention below. Contact Larry Dean (513-502-0108) if you have questions or head to the NJCL Convention Overview. If you’d like a personal insight into what Convention is like, consider checking out our famous “Dean’s Blog!” Here is Dean’s Blog of the 2015 NJCL Convention at Trinity University. Registration for NJCL Convention has closed as of June 6. Larry Dean is again running a summer Latin program here at Summit for 15 days, Mon June 13 – Fri July 1, 8:30-12:30. It is intended for motivated students, regardless of their level of Latin – from beginners in the 6th grade to advanced scholars who have graduated. Students can sign up/show up anytime. It is a great learning environment, with motivated students from throughout the Cincinnati area and even from other parts of OH – and they all have the same joy of learning and love of the classics. Here is the link to the program from the Summit webpage: http://www.summitcds.org/programs/academic-summer-school.cfm. Please call Larry Dean at 502-0108 if you have questions. NATIONAL CONVENTION: The State Latin Convention in Columbus was a great experience! Below is some information about this event. Please contact Larry Dean (513-502-0108) if you have questions or check out the NJCL Convention Overview. The National Junior Classical League Convention is held every summer on a college campus. Here is the link to the website on the convention: http://njcl.org/pages/convention-registration. This summer, it is Mon July 25 – Sat July 30 at Indiana University in Bloomington, Indiana. Students and teachers stay in the student dormitories (girls and boys in separate housing) and eat in the student dining halls. All events are on the campus, within walking distance. Much of the campus is completely devoted to the National Convention. Larry Dean will again organize bus for Summit students and other Cincinnati area Latin students (around $30), and Nora Murphy & Christy Bening will do the same for the Cleveland/Columbus students (price TBA). The Cincinnati bus will leave on the morning of Sun July 24. Students are not required to travel with the group, but it is a bonding experience and a good time. You will need to pay for ‘Pre-Convention Housing’ ($55) if you travel with the group since we are arriving a day early. About 1,600 Latin students from across the country – from rookie 7th graders to veteran seniors who have graduated – participate in the National Convention. OH always has a large delegation of students, teachers, and parents, usually a little over 100. All OH teachers (from schools like Indian Hill and and McAuley and Moeller and Shaker and St. Edward and Summit) chaperone and help the students – the ratio of students to chaperones at the convention is about 8 to 1. The cost is $495 for registration, housing, and food. Here is the link to the online registration (it is at the very bottom of the page): http://njcl.org/pages/convention-registration. You do this on your own; unlike State Convention, teachers do not sign up the students. You will then be emailed a registration packet, which your child will need to bring to school to be signed by me. The price for convention increases on April 3. Below is older NJCL information from previous Conventions. Everyone, SAT AUG 1: The OJCL has ordered 2 40 person buses for Sat Aug 1 – one will arrive at Trinity at 5 am (for the 7 am flight of the Cincinnati group), one will arrive at Trinity at 6 am (for the 8 am flight of the Cleveland group). The cost is $10 – cash or check to OJCL. THIS WILL BE COLLECTED AT CONVENTION, SO BRING THE $ OR THE CHECK WITH YOU, DO NOT SEND THIS TO ME. THERE IS NO SIGN UP FOR THIS, JUST BRING CASH/CHECK TO CONVENTION AND THERE WILL BE A SPOT FOR YOU. REQUIRED FOR OJCL’ERS: Treasurer Kelly Thaxton and President Lindsey Dierig have created an Etsy account for participants to get the state tshirt + spirit stuff. The price is $19.20. Sign up and pay online here: https://www.etsy.com/il-en/listing/236260927/ohio-delegation-njcl-package?ref=shop_home_active_1&ulsfg=true. Announcement: OH Competitive Certamen Teams at Trinity! Thanks to all players – 24 students from 7 different schools – who participated in the tryout process! Larry Dean (Summit) is again running a summer Latin program in Cincinnati for 18 days, Mon June 8 – Wed July 1, 8:30-12:30. It is intended for motivated students, regardless of their level of Latin – from beginners in the 6th grade to advanced scholars who have graduated. Students can sign up/show up anytime. It is a great learning environment, with motivated students from throughout the Cincinnati area and even from other parts of OH – and they all have the same joy of learning and love of the classics. Here is the link to the program from the Summit webpage: http://www.summitcds.org/summerprograms/academic-summer-school.cfm. Please call Larry Dean at 513-502-0108 if you have questions. Congratulations to the 2014 OH Competitive Certamen Teams! OH T-Shirts for the 2014 NJCL Convention: All OJCL delegates must purchase the state t-shirt. It will be worn on Tues, the 2nd day of convention. Order the $12.50 shirt through this Etsy account [deadline is July 7! ]: https://www.etsy.com/search?q=ojcl&ship_to=US. Even though the Etsy account requires you to fill out a shipping address, all tshirts will be distributed at the OH fellowship meeting down at Emory. All tshirts will be distributed at the OH fellowship meeting down at Emory. Here is the complete list of 2014 OH people attending Emory NJCL. Congratulations to the winners of this year’s $100 OJCL Scholarship for the 2013 NJCL Convention at UNLV. It was quite a big pool of applicants, so the committee decided to give 16 total. The list includes academic scholars, classically inspired artists, leaders, and all-around JCL’ers. The essays for the Level 1’s were excellent, with insightful and funny comparisons to Martial, Augustus, Ancus Marcius, and Julius Caesar.